A common theme in many cabin fever movies is paranoia. Let me be the first to assure you that the walls are not actually closing in on you. But if the sensation persists, close your eyes and pretend that you're a sentinel in the tronera at El Morro, a military fort of great importance in Puerto Rican history. Personally, I'm not too big of a fan of tight places, but Bonn of Time Travelling has given me good reason to climb into the tronera, which is essentially a vertical hole carved into the fort's walls. (And you thought being trapped at home was difficult!) While investigating this space, Bonn found some interesting etchings that will transport to you to the time of conquistadores and pirates (fittingly, given the name of his blog)—which may be just what you need to hold the doldrums at bay. Another common element is hallucinations—both visual and auditory. 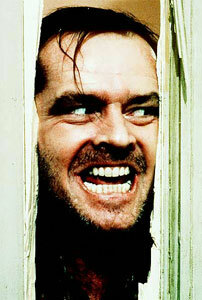 Are you hearing the word "REDRUM" whispered as you pace the floor? If that's indeed the case, you may want to wander over to Afarensis where you'll find that sometimes blood thirsty reputations are more color than substance: New evidence suggests that the Carthaginians weren't quite as into sacrifices as once believed. With the understanding that careful analysis often reveals hidden truths, I encourage you to banish the whispering, cajoling voice by reading Relics Fail where Julien from A Very Remote Period Indeed discusses belief and relics, with a fabulous case involving St. Bridget to illustrate his point. Both of these posts emphasize the way science can be utilized to dispel false or misguided beliefs. If you're fortunate to still have power, be social! Lately, my entries at Anthropology in Practice have focused on questions of digital sociality and digital personas. The newest entry into the social networking/social media milieu is Google Buzz, which I think has immense potential despite its poor reception. After you're done checking Facebook (New Photo Album: Trapped in House, Day 4! "Like"?) and updating Twitter (Stuck in house. SO #bored. When will snow/rain stop??? ), come on by and discuss the social aspect of social networking. While you've got the digital connection working, Colleen of Middle Savagery asks that you use another Google app—Google Wave—to let her know if you're currently involved in single context archaeology projects. Whew. I think we made it. The fire is dying down, and from what I can see the rain has melted most of the snow. Time to make a break for it! Until the next Carnival, cheers!